Nurse Redheart loves her job. She’s the head nurse at Ponyville Hospital, and she helps take care of everypony in town. It’s a very rewarding job, and she loves it very much. At least that’s what reminds herself of every day. The only thing that Redheart loves more than her job is Feverfew, her pet skunk. So when Feverfew gets sick after the veterinarian’s office is closed, Redheart knows there’s only one pony she trusts with her beloved pet’s care. Meanwhile, Fluttershy seems to think that Feverfew isn’t the only one with a problem, and that not all ailments are physical. Proofread by ArchAngelsWings, Eddie Grammar, and Mind Jack. 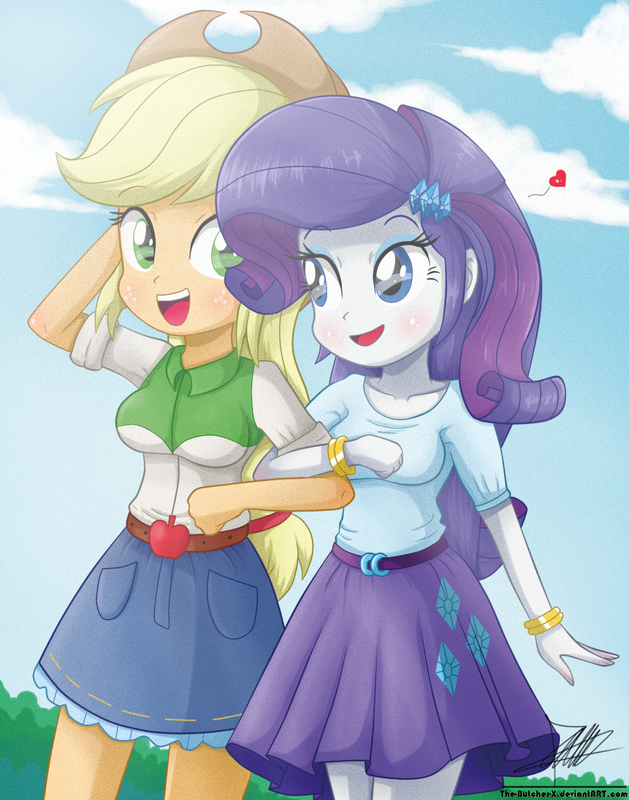 Rarity and Applejack are dating, which obviously causes plenty of silly and cute scenarios. Here are a few of them. Several one-shots, heavily featuring Rarity and Applejack (duh) that my friend Char-Char-Chan inspired me. Twilight thought it was simple. You picked one mate, and it either worked out and you got married, or it didn't and you found a new mate. But at least on the other side of the portal, things get a little more complicated. A simple question from Sunset leads to a relationship she didn't know was possible, and happiness she didn't know she'd ever find. A series of vignettes as Twilight, Fluttershy, and Sunset learn and grow their relationship together. Proofread by Krickis, crazy-little-tardis, edgar-allen-poes-sweet-lenore, Gara and Caravel. Twilight Sparkle, the outcast of CHS, has fallen in love with the most popular girl in school. With a ticket to the grandest party in her hand, she hopes to win Sunset's affection by making this one night absolutely perfect. But is she perfect enough? Cover art done by Apri! This story was featured on the FiMFiction front page on 31st July 2017! Thank you all for your support! Fluttershy, a young timid girl and computer hacker, gets the chance of a lifetime when she comes across a strange website. Through this site, she gets a strange device called a "Digivice" and meets her Digimon partner. She soon learns that she's not the only one, as five other girls around her age all get Digimon of their own. Each one has a different goal, and while some work together, some seem to be enemies. Unable to tell friend from foe, Fluttershy and her new friend Guilmon must work together to protect both the Real World and the Digital World. But will they become the saviors that we need, or the monsters that will destroy us all? This is an original story combining themes of both My Little Pony and Digimon. All rights go to their individual companies. They say she's the whitest unicorn that ever lived. They say she carries a guitar case with her everywhere she goes. They say if you cross her path, bad things will happen to you. If you venture into the seedier parts of Old Mexicolt, you'll hear whispers and rumors in the shadows of dusty bars and dingy hotels. Rumors about her...the one they call La Rariachi. Over brunch, Twilight Sparkle lines out her plans to turn to a life of villainy. For the most part, her friends are all for it. It makes sense in context, honest. Hearts and Hooves... Oops, Valentines day is a day away and Applejack has plans for hers and Rarity's first Valentines day together. Hopefully the weather doesn't put a damper on the fields or Rarity's health. Team PART(ie) is back! After a terrible defeat at the hands of Discord, Pinkie and her team tries recovering and passing their classes, but diabolical plots, demented fiends and hard tests won't let them.